Owl News All About Owls Owl Art Owl Photos Owl the News You Need! 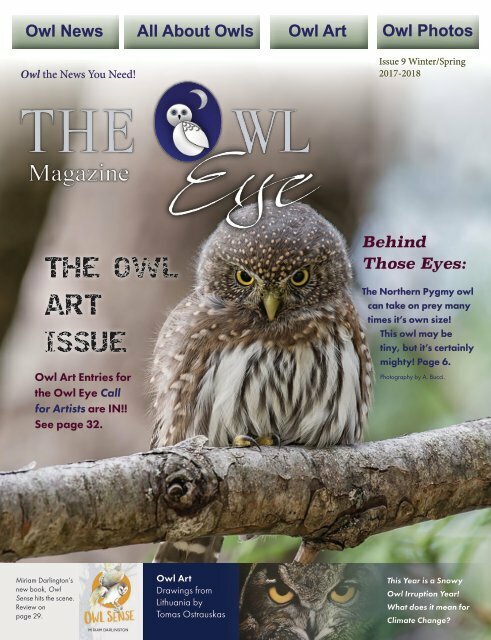 Issue 9 Winter/Spring 2017-2018 Behind Those Eyes: Owl Art Entries for the Owl Eye Call for Artists are IN!! See page 32. The Northern Pygmy owl can take on prey many times it’s own size! This owl may be tiny, but it’s certainly mighty! Page 6. Photography by A. Bucci. Miriam Darlington’s new book, Owl Sense hits the scene. Review on page 29. Owl Art Drawings from Lithuania by Tomas Ostrauskas This Year is a Snowy Owl Irruption Year! What does it mean for Climate Change?